Some 365 million miles away sits a cloud of gas so large it weighs more than Saturn, Uranus, and Neptune combined. It’s so powerful it’s been accused of slinging entire planets into the sun, and so ancient it could hold the key to the origin of Earth. I’m talking about Jupiter; a tempestuous beast of a world that has inspired fear and awe for centuries. After decades of scrutinising Jupiter’s swirling cloud tops and glowering red eye from afar, we’re finally going to pull back the curtain and learn what lies beneath. When NASA’s Juno spacecraft — a 180-kilo box of reinforced titanium strapped to a 20-metre-long solar panel — arrives in orbit around Jupiter on July 4th, humans will be able to peer beneath the monstrous gas giant’s upper atmosphere for the first time, down into the layers of poisonous thunder clouds packed below. Over the course of a year, Juno will map the entire surface of Jupiter, all the while using nine scientific instruments to probe the gas giant’s interior composition and powerful magnetic field. “Nobody’s ever seen Jupiter the way we will,” Juno mission director Scott Bolton told Gizmodo. By the time the spacecraft makes its suicide plunge into Jupiter’s atmosphere, we’ll have a detailed understanding of the gas giant’s inner workings, and a better picture of how our solar system formed. One might ask why, as self-interested beings with a world’s worth of problems here on Earth, we should bother studying a planet as hostile as Jupiter. Shouldn’t we focus on getting people to Mars, or mining asteroids for scarce metals, or discovering habitable worlds beyond our solar system in case we screw this one up beyond repair? No doubt, these are all important goals. But so is the study of planets in our solar system where life could never survive. After ballooning in size, Jupiter used its hefty gravity to shape the solar system around it, clearing out ancient comets, asteroids, and perhaps even planets. Many theorists suspect that Jupiter’s dust-busting activity set the stage for the formation of Mercury, Venus, Earth, and Mars. But 4.5 billion years has made the details fuzzy. To understand exactly how the planet-forming palooza went down, we need to know what elements were available in the early solar system. Jupiter, like our sun, is composed primarily of hydrogen and helium. But it’s also enriched in heavy elements that are critical for forming terrestrial planets. Using microwave sounding, Juno will determine the global abundance of two key elements — nitrogen in the form of ammonia, and oxygen in the form of water — throughout Jupiter’s atmosphere. Juno will also shed light on the nature of Jupiter’s core, which features temperatures hotter than the surface of the sun and pressures tens of millions of times greater than that of our atmosphere. Some believe the core to be a solid hunk of metal larger than our planet. Others say it’s a high pressure sea of hydrogen and helium gas. Discerning between these wild possibilities will not only constrain models for the evolution of the solar system, it’ll help us understand the origin of the gas giant’s enormous magnetic field. Which brings us to Juno’s next big goal: studying Jupiter’s magnetosphere. Jupiter’s magnetic field is nearly 20,000 times as powerful as our own, and the region it influences, called the magnetosphere, is the single largest “object” in our solar system. The magnetosphere has a tadpole shape, ballooning 600,000 to two million miles toward the sun and stretching all the way out to Saturn some 600 million miles distant. Within this region, swarms of charged particles are trapped and pulled in toward Jupiter, where they cause powerful geomagnetic storms. Jupiter’s poles are alive with never-ending northern light displays that span regions larger than the Earth itself. 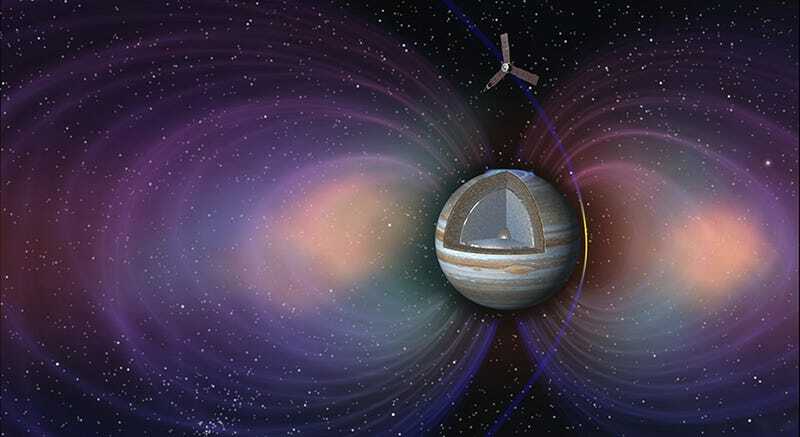 By passing over Jupiter’s poles and taking careful measurements of charged particles and magnetic field strength, Juno will offer insights into the fundamental processes underlying space weather, including how it forms and how powerful it can get. Dangerous is a key word: to do all this science, Juno is going to be flying into the most intense radiation environment in the solar system. On Earth, we’re exposed to a background radiation of about 0.3 rad. During a series of low altitude passes that bring it within 3,100 miles of Jupiter’s cloud tops, Juno will be exposed to a radiation environment of approximately 20 million rad. To keep the spacecraft from frying, the flight computer and the cores of most of its scientific instruments are being stored inside a first-of-its-kind radiation vault — a hefty titanium box that reduces radiation exposure approximately 800-fold. The solar cells lining the wings of the spacecraft have a special radiation coverglass, and the orbit was also carefully designed to minimise exposure to Jupiter’s intense radiation belts. Even with all of these precautions, the spacecraft will accrue radiation damage over time. But Nybakken feels confident that the mission will survive long enough to accomplish its key science goals. “We’re going into orbit in a region nobody’s been before, so yes, there is going to be some uncertainty,” he said. “But in a sense, we’re standing on the shoulders of giants. Not only does the spacecraft build on other solar system missions, but on what we learned from Galileo,” he said, referring to first space probe NASA sent into orbit around Jupiter, in the 1990s. For Nybakken and the engineering team, the nail-biting moment will come on the evening of July 4th, when a 35-minute main engine burn slows the spacecraft down from a rip-roaring 150,000 miles per hour so that it can be captured by the gas giant’s gravity. 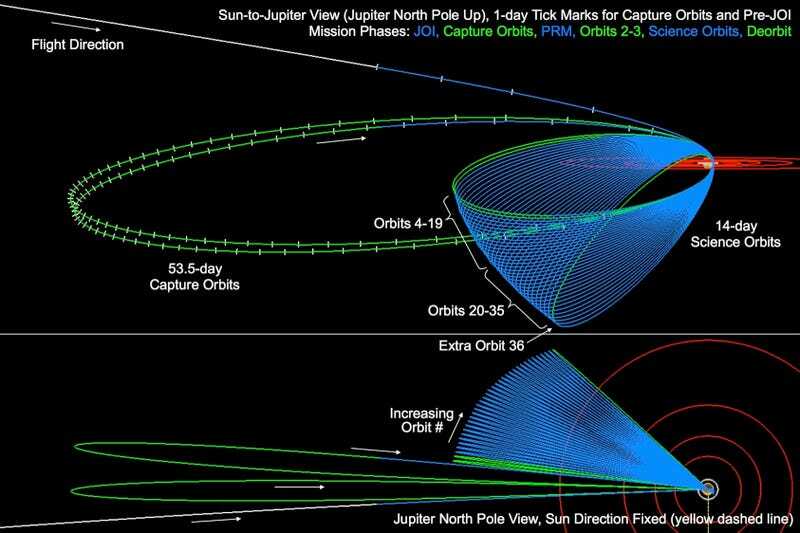 If this manoeuvre doesn’t go off perfectly, Juno won’t enter Jupiter’s orbit, and there’s no mission. There’s no way of issuing a course correction en route, because it takes 49 minutes for a signal to reach the spacecraft from Earth. In the meantime, we can expect to learn a wealth of information about Jupiter’s inner workings in the months and years to come. And while there’s little chance of finding life in its noxious ammonia thunderclouds, the opportunity to explore the strange, hostile planet that shaped a tiny dollop of starstuff into the solar system we know and love isn’t a bad alternative. In discovering Jupiter, we’ll discover a part of ourselves.